PingHurry is a free visual ping tool with a flat and 3D graph window or console list overview. If your job requires to do connectivity checks several times a day, then this is the right tool for you. With PingHurry a ping/trace/reverse lookup/TCP port scan task is one hotkey away, just show/hide the PingHurry window by using the hotkey or system tray icon. It has several other features like zooming in the flat graph, IPconfig info, flush dns and a built-in TCP Port scanner. 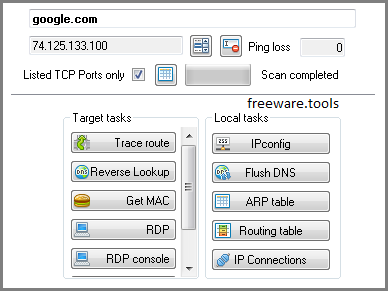 It's a handy ping tool for network administrators that enables them to check a host's availability and perform various other commands. Specifically created for network administrators, PingHurry is a good alternative to the command prompt, enabling them to check the availability of a host and perform various other similar tasks. The intuitive GUI makes it a more user-friendly and handy tool for those who don't prefer working with the command prompt. At launch, PingHurry is automatically sent to the system tray, waiting for you to access it whenever needed. The main window can be brought to focus using either the tray menu or the dedicated hotkey. As its name suggests, the main function of PingHurry is to send ping requests to a specific IP address or host. You are free to customize the command parameters, such as the timeframe and the time interval between two consecutive requests. The result is displayed just as it would appear in the command line window, enabling you to view the reply time. Additionally, PingHurry also shows a conclusive graph to represent the ping response over time, which can be sent to the clipboard and pasted in other programs. The application can execute various tasks aside pinging hosts. It allows you to trace route data packets to identify delay causes, it can perform reverse lookup tasks and enables you to obtain the MAC address of a computer in the network. With the click of a button you can instruct it to get information about the network configuration of the local workstation (using the 'ipconfig' command), flush DNS data and view all IP connections. The results can be instantly copied to the clipboard or saved as a text file. PingHurry provides a complete toolbox for any network administrator, enabling them to promptly respond to all the connectivity problems that might occur. With its help, you can execute common network diagnostics operations without having to manually type in instructions in the command prompt, which saves you both time and effort.